Diesel engines remain a vital part of America’s industrial and transport infrastructure. From commercial trucks and cars to trains and ships, diesel engines help ensure that goods and people get to their destinations. In addition, many businesses and organizations make use of diesel generators, whether it is to provide emergency power or to operate a facility that is unconnected to the larger power grid. Because of this, diesel mechanics are vital in order to ensure that America’s transport and energy infrastructure remains strong. Diesel mechanics currently enjoy excellent employment and salary options, regardless of their specialty, making this field a wise choice for newly graduated students and individuals seeking a new career alike. Diesel mechanics are especially important in Arizona, especially in major cities like Phoenix, Tucson and Flagstaff.. Due to the state’s size, it is extremely dependent on diesel transport, both road and rail based. In addition, many private individuals own diesel powered vehicles, making the easy availability of qualified mechanics vital to the smooth operation of Arizona’s diesel vehicles. Diesel mechanics do not require state licensure, although employers often have their own requirements that must be completed before they will hire a new mechanic. For this reason, one of the best paths to becoming a diesel mechanic is a course of formal education. Many community colleges and vocational schools provide training courses for individuals interested in becoming diesel mechanics. Depending on the school, these courses can range from six months to two years in length and will confer a certificate of completion or an associate’s degree when the student successfully completes the course. Some schools offer part time options for those students who are currently working or who otherwise cannot attend the program on a traditional schedule. Some schools offer online diesel mechanic programs. These programs allow the student to arrange his or her education around work and family schedules. Online programs enable the student to observe lectures, download reference material and interact directly with the instructors via chat and email. However, some programs may require the student to physically attend lab sessions and class examinations. Because of this, the student should verify if and when he or she must be physically present with the program administration. Diesel mechanic programs cover a wide range of subjects, designed to ensure that their graduates are fully capable of maintaining, diagnosing and repairing diesel engines. The theory of how diesel engines operate and the most common types of malfunctions found in diesel engines. Electronic systems, such as battery and starter components. Fuel injection, ignition, and computer systems. Computer systems are an increasingly important part of any course, due to the fact that all new diesel engines incorporate extensive electronic support. Troubleshooting and failure analysis. 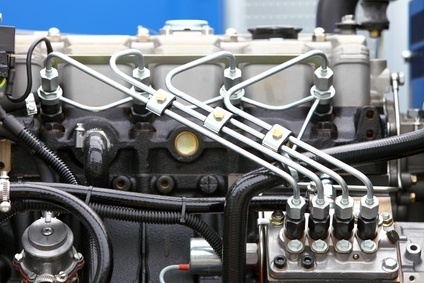 This process allows the diesel mechanic to determine why an engine has failed, as well as determine the best possible solution to the problem. These courses also include extensive training in how to use increasingly advanced electronic diagnostic systems. Emission control systems. In some cases, a diesel engine mechanic may be required to obtain state certification before being allowed to work on a pollution control system for diesel engines. Although graduating from a diesel engine mechanic program allows the student to immediately seek employment, there are other options that can be used to improve the new graduate’s professional options. In some cases, a business, whether it is a small garage or large corporation will prefer to train newly hired mechanics for a time in order to ensure that they have sufficient experience in the field. Another common method of obtaining experience is to enter an apprenticeship with a company that is associated with the student’s school. Internships usually take place before graduation and allow the student to work in a functioning garage, while still enjoying the supervision and assistance of his or her instructors and supervisors. This can be especially useful due to the fact that a successful internship can lead to full employment after graduation. The National Institute for Automotive Service Excellence (ASE) is a professional body that offers certification for those diesel mechanics who desire to attain a high level of proficiency in their field. There are many specialties that the mechanic can seek certification in, all of which require extra study and the successful completion of an ASE provided examination. Many companies prefer to hire certificated diesel mechanics in order to ensure that their staff is as skilled as possible. For some businesses, certification may be mandatory for individuals who are seeking employment. Finally, some businesses will hire an individual who has not yet completed his or her diesel mechanic program. In this case, the employee will be instructed by the company while completing those tasks that he or she is suited for. As the employee’s skills increase, the company will assign more complex tasks until the employee is considered a fully trained diesel mechanic. Depending on the nature of the apprenticeship, the instruction may include formal classes or be provided as on the job training. Ultimately, becoming an Arizona diesel mechanic is an excellent choice for those individuals seeking a secure and respected career. The Bureau of Labor Statistics (BLS) currently estimates that there are over 242,000 diesel mechanics in the United States and that number continues to grow as the economy improves. In addition, by earning a median annual salary of over $41,000, diesel mechanics earn well above the average for fields involving a similar level of training and education. Whether an individual is entering the job market for the first time, or considering changing to a more rewarding field, becoming a diesel mechanic can be an excellent personal and professional choice.